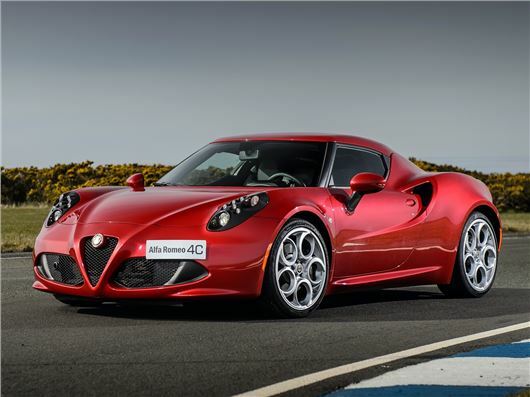 So, sorry we can't bring you a road test of the Alfa Romeo 4C. But the engineers, marketeers or PR people decided that we'd learn all we needed to know about its exciting new carbon-tubbed junior supercar without actually turning a wheel on the Queen's Highway. To be fair, we were there to drive the improved, more tax-friendly 2014 Giulietta and MiTo, and the 4C was there for one very important reason that I'll come to in a moment. On our sortie, we were treated to a number of flying laps in the 4C. Don't get excited, we didn't run on the magnificent TT circuit, but the much more modest - and flat - Jurby ex-airbase, which may well have flattered the 4C to some degree or another. Why? Because although the layout was tight, the surface was uncambered, and lumpy only on the back straight. Fittingly, Alfa Romeo made sure the test 4C was specified with the optional £3000 performance pack - after all, we were on track, this would be the best way of exploiting it. So what of the 4C's performance on a windswept Jurby? Well, the acceleration is stunning up to about 100mph, with the turbocharged 1742cc delivering an impressively linear slab of power from 2000rpm. But in the confines of the track we weren't close to expoiting this - what we did do was get a first hand account of the benefits of its light weight carbon tub, superfast TCT gearbox and mid-rear drive configuration. The fast unassisted steering is hefty at low speeds, but wind some speed in, and the lightweight Alfa responds with some pretty astounding direction changes. Turn-in is quick, almost savagely so, thanks to its direct and talkative steering, while the communication and feedback, on track, are both excellent. You can lean hard and push to some mighty speeds, and when the rear end let goes (after some initial understeer), it can be caught in a series of big, ugly drifts. But only if you're really on it. In short, it feels nicely dialled-in to the track, and you can imagine that many owners will do just that in their own time on weekends away from home. But the real reason the 4C was in the Isle of Man was not so much about what we thought it can - and can't - do on the road, but to act as one very pretty all-Italian halo product. And as halo products go, it has all the glamour you would ever associate with the finest cars in Alfa Romeo's back catalogue. It's pretty and striking, it makes a great noise, and it's so suffused with Alfa Romeo DNA, that there's no way even the most casual car spotter would mistake it for anything else. It's an all-Italian effort, too, as the company's management was keen to point out to us, and one that's technically impressive - cars with carbon tubs usually cost a hell of a lot more than £45,000. But despite all this, it is a halo product that's designed to sprinkle the rest of the Alfa Romeo range (currently just MiTo and Giulietta) with its reflected sexiness. And in part it does. You see the three cars lined-up, and you can see the marketing advantage of the 4C. However, when speaking to the Italians about Alfa Romeo and its future, they pretty much all go back to Fiat Group's Chairman, Sergio Marchionne's upcoming announcement about future strategy, planned for May. It's clear that Alfa Romeo and Lancia will be under much scrutiny. Why? Because Fiat's destiny is now set as Italy's answer to MINI, while Ferrari will continue doing what it does so brilliantly. It's the meat in the middle that matters to the Italians right now. And they've clearly been looking at the success of the UK car industry. MINI might be going through growing pains, but its image and product is gilt-edged, and with the 500 range, Fiat is confident in earning a piece of this. In fact, in many markets, the original 500 hatch outsells its MINI counterpart. Lancia is finished, though - it'll be put on ice, as a series of badges and Italian market-only specials. But an interesting future awaits Alfa Romeo and Maserati, which will become the Italian answer to Jaguar Land Rover. With Fiat now firmly in control of Chrysler, we hear that an Alfa Romeo duo of rear-wheel drive cars developed in conjunction with its US subsidiary to go toe-to-toe with the forthicoming Jaguar XE and XF, with a Jeep-based alternative to rival the BMW X3 and Audi Q3. Does that mean the MiTo and Giulietta won't be replaced? Don't bet against it. As for Maserati, it showed an F-Type rivalling concept at Geneva, while it already builds a Jaguar XJ rival in the form of the brilliant Quattroporte. And what Alfa Romeo is going to need during this time of change is attention-grabbing cars like the 4C to show the world that the more grown-up company of the future is still capable of making desirable products. We can't wait to tell you what they're like to drive... on the road as well as the track.